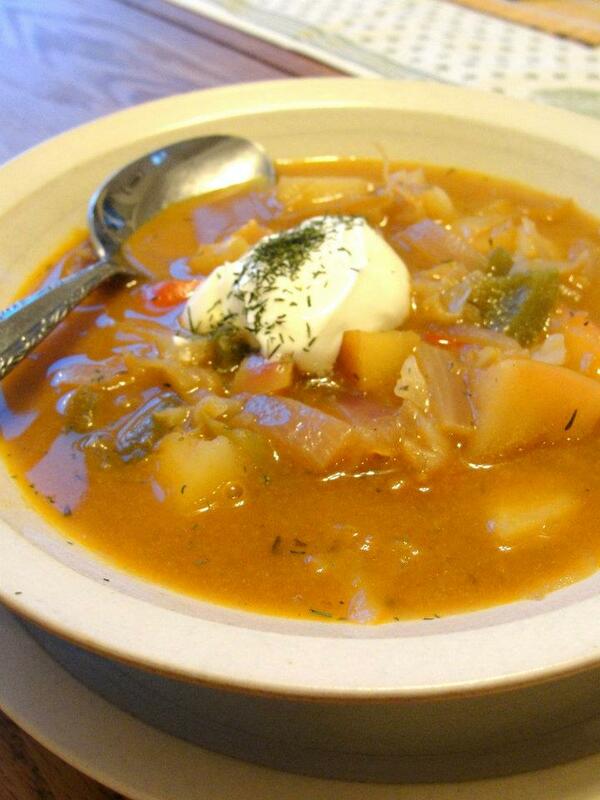 Here’s a nice eastern-european-style vegetable soup that you can make if you happen to have apples and sauerkraut as I did, leftover and seasoned from making Baked Pork Chops. The soup starts with a light chicken or vegetable stock (8 cups), then seasoned with thyme (1 T), dill (1 T), garlic (6 cloves, minced), mild paprika (2 T), ground pepper and/or peppercorns (1 t), salt to taste. Next add a couple tablespoons each of tomato paste and mustard (I used a smooth Dijon mustard). Sauté vegetables in a couple tablespoons oil until just slightly browned/carmelized: diced red and/or yellow onions (1 each, medium or large), diced green and/or pepper (2), green cabbage (~1/4 head, sliced), celery (2-3 stalks), diced potatoes (2 large), and about 1 1/2 cups sauerkraut (seasoned with about 1 T brown sugar, a bit of cinnamon and allspice and sautéed lightly); add these to soup, bring to a boil, then reduce to low heat and simmer for 30-45 minutes, until potato is tender. The sweet part of the flavor is aided by slightly carmelizing the vegetables and by adding diced apple (2 small, e.g., Gala) for the last 15 minutes of simmering (so that they don’t disintegrate). I served this topped with a dollop of sour cream, a sprinkle of dried dill, and sourdough croutons. Overall, it’s something like an onion soup crossed with a mild chinese hot and sour soup. Tasty!